The sounds on this pinball machine were working when the machine was first turned on. But after a very short time, the sound would go wonky. After some discussion with the owner, we determined that the sounds themselves were not defective, it was just the wrong sounds playing at the wrong time. For example when hitting a particular target you’d hear the ball drain sound rather than a speech clip. Pressing the self-test on the sound board yielded all of the correct sounds. This indicated that the sound select signals from the MPU board were not correct. With the oscilloscope, I looked for pulses on pins 10-14 on IC 10 on the sound board, while the owner triggered things on the playfield. Some signals were missing. When I checked the same signal at J3, they were present. The culprit was cracked solder joints on the connector. In the photo below you can see cracked solder around the top three and the bottom three pins on the connector. 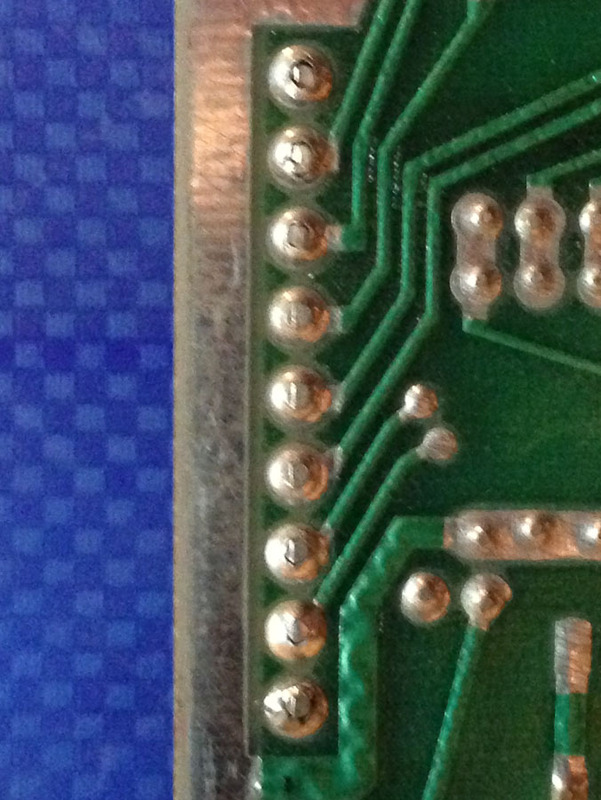 Cracked solder joints on connector pins. At the owners request, I pulled all of the boards out of the backbox and touched up any solder joints that looked suspicious. After that, the proper sounds sounds played at the proper times.